We provide a Skipper and a crew member on board for our private charters. Our crew have many years experience on the water and can offer you a wonderful experience at sea on board Oceanique. 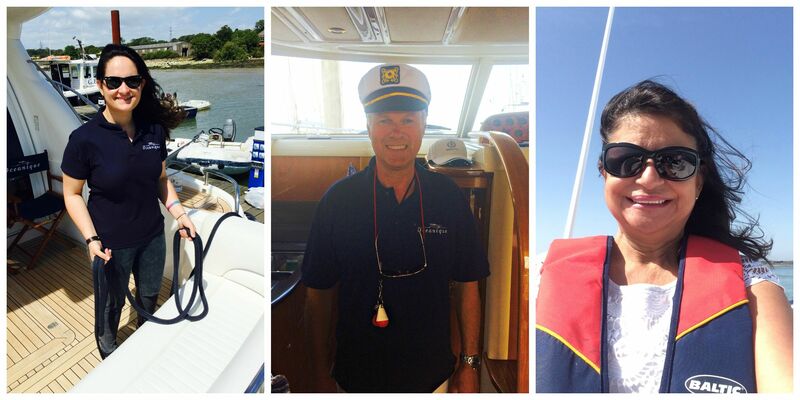 Mark, our Skipper, has been on and around boats since he was a child and, in fact, Mark and Nadia’s first date was on Mark’s 14′ speed boat in Poole Harbour back in 1990! Since then they’ve been committed boaters including sailing yachts and catamarans, owning a succession of vessels up to their current motor yacht, Oceanique. Mark’s qualifications include, Yachtmaster Coastal (commercially endorsed), first aid, sea survival training, VHF radio licence and the RYA Professional Practices and Responsibilities Certificate as well as a current medical certificate. Nadia and their daughter Mel crew with Mark and they hold Day Skipper, First Aid, and Sea Survival Training. They will handle ropes and be responsible for your safety on board and the running of the galley.